After the chaos of Christmas, I needed to hole up in my sewing room and make something "just because." This is what I came up with. All from stash. 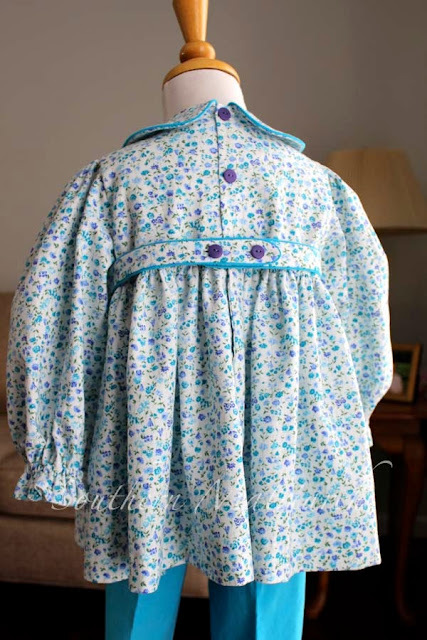 Princess's favorite dress is her "beautiful flower dress" made from Old Fashioned Baby's Toddler Dress and Apron. A friend made it for her last winter and it will fit all the way through this winter. The pattern is out of print but sometimes comes up on ebay or etsy. Perhaps if enough people request it from Jeannie she will reprint it. It is a great pattern. Fits great, goes together in a breeze. Mommy has to hide the dress at the bottom of the drawer sometimes or she would wear it everyday. 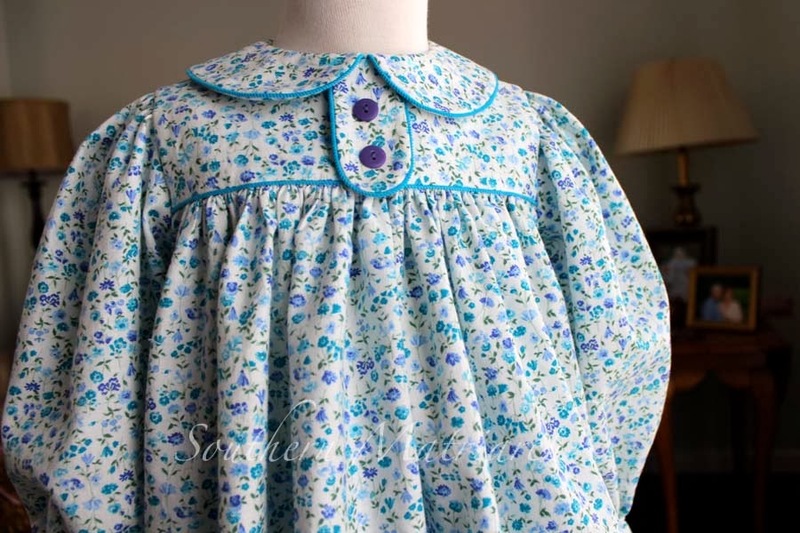 I had intended to use one of the other newer Children's Corner patterns for a top but Mom spied this pattern and requested this dress be made into a top. So that is what I did. I used a brush twill for the top and featherwale cord for the pants. As much as Princess loves dresses, sometimes that long walk to school is cold! Since it was all from stash the buttons are purple instead of turquoise. That is okay. Purple is her favorite color. I piped it with SCRAPS of the corduroy. It is pieced with about a dozen strips to get enough. 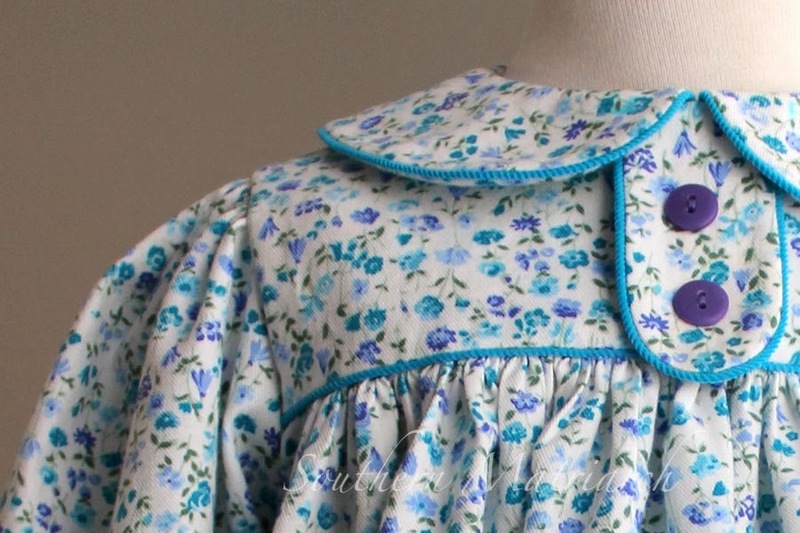 The piped belt and front tab makes this little dress/top a piping hog, so piecing the bias strips it was. I did reduce the fullness of the skirt front and back by about 3" each. For a top I didn't want quite as much fullness. Again, I used Children's Corner Parker's Pants for the pants. If you don't have this pattern, you need it. Goes together in a snap and has a great ready to wear fit to them. Sometimes pants can have enough crotch room for three people and the legs are so wide they look like clown pants. Neither is the case with this pattern. It is what I used for the pj pants. I will use it many more times I think. I have some corduroy in mind for Wildman. I don't have a photo of it being modeled. She wore it on the airplane and Mimi wasn't much into snapping photos at 3 a.m. I hope you have found something to work on "just because." 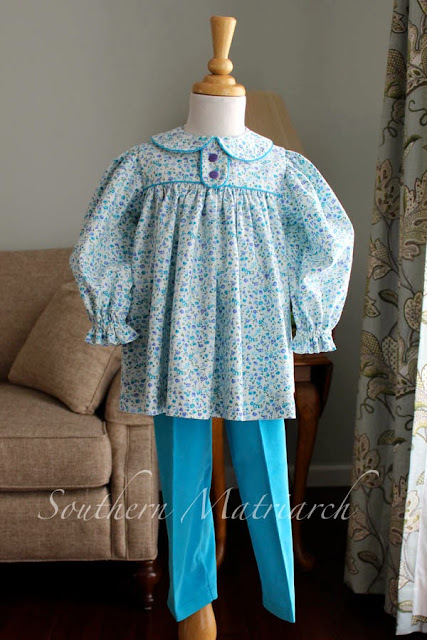 Such a precious little blouse and pants! Ellen, I measured to the bottom of her bottom. That is where Mom wanted it to hit. Oh! That does my heart good to see! I loved those fabrics and glad you put them to good use so speedily! Janice, this is OFB Toddler Dress and Apron. 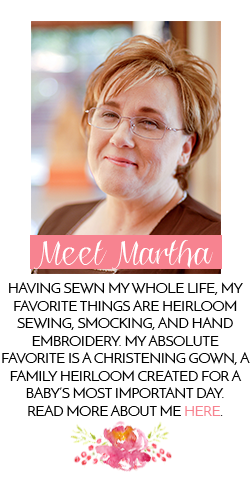 It is no longer in print but can sometimes be found at heirloom retailers who still have copies or on ebay and etsy. Jeannie does have a couple of toddler sized patterns. 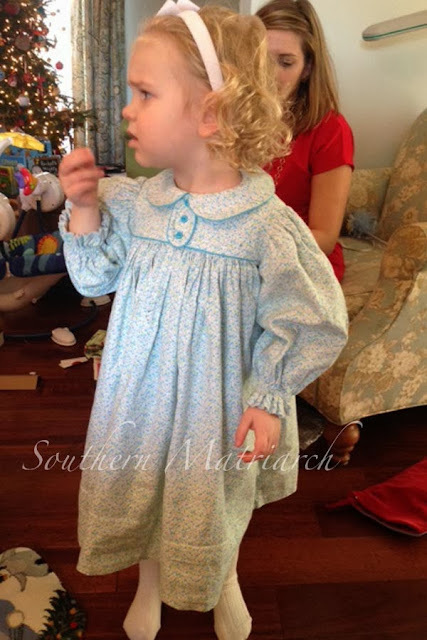 Toddler Summer Dresses and Antique Toddler Dress. I neglected to answer your question, it is a size 3. It fits perfectly. She is three and a half.